In this issue: not only key events in Paris, arty venues in the capital and its main autumn sales, but also the new art districts in Beijing, major fairs in Shanghai and exclusive interviews with Chinese artists like the jeweller Wallace Chan, the star of the latest Biennale des Antiquaires de Paris… Because everyone is talking about China, because not a day passes without the Middle Kingdom making the economic, political and even cultural headlines, because over the past few years the place of the world's second largest economy has become predominant in the art scene, forging ahead of both NewYork and London, and, finally, because Europe seems to have become the last Eldorado for China, La Gazette Drouot, now a grand old lady of 121, is opening out to Asia. 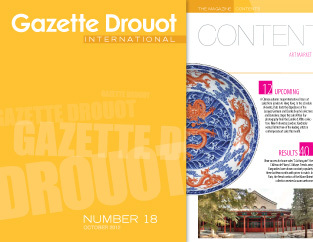 Our magazine now publishes another international issue in Mandarin, entirely dedicated to art and the art market. Bonne lecture!